I always make treats for students at the end of the semester. And this year is no different. 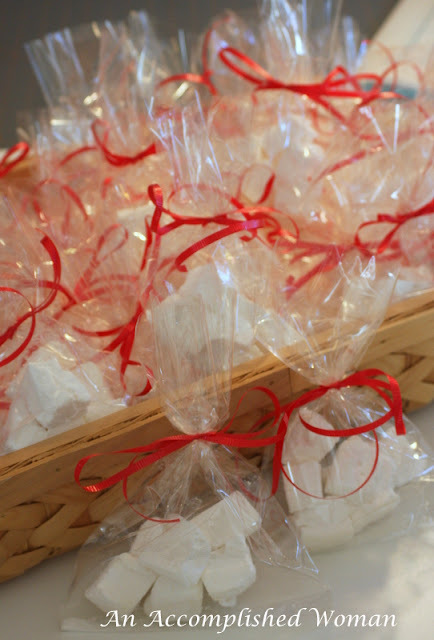 I have made these marshmallows many times, but thought how festive they are with the glassine bag and curling ribbon. Even the simplest wrapping can be made special. Marshmallows are my family and friend’s favorite holiday treat. Cut a piece of aluminum foil long enough to cover the bottom and sides of the pan. Place the foil in the pan and press it gently into place. With a pastry brush or crumpled wax paper coat the foil thoroughly but lightly with vegetable shortening. Set aside. Place 1/2 cup cold water in the large bowl of an electric mixer, Sprinkle the gelatin over the surface of the water and set aside. Notice, it is not imperative to use a halloween dish but nice to mix your holidays. I doubled this recipe so I have 1 cup of cold water and 6 packets of unflavored gelatin. Place the sugar, corn syrup, salt and the other 1/2 cup water in a heavy 1-1/2 quart or 2 quart saucepan over moderately low heat. Stir until the sugar is dissolved and the mixture comes to a boil. Raise the heat to high, insert a candy thermometer, and let the syrup boil without stirring until the temperature reaches 240 degrees. This process takes a little while so be patient. At 10 minutes of mixing, here you need to add vanilla. A side note, you can add peppermint extract or any other flavoring you would like. Prepare a long, heavy, sharp knife by brushing the blade lightly with vegetable shortening. Cutting down firmly with the full length of the blade, cut the marshmallow into 1 inch strips and each strip into 1 inch squares. Place the cubes on a cookie sheet with extra sugar in it. You can cut out the marshmallows into shapes, or pipe into PEEP's at this point.